In David Byrne’s Secret Life Of Humans, Ava, a young scientist, and lecturer poses a pivotal question, "What does it mean to be human?" How different is it from the rest of the animal kingdom? Byrne's creative exploration of this basic question is inspired by the work of the late mathematician and scientist Jacob Bronowski, creator of the popular 1973 television series, The Ascent Of Man. Bronowski traced human progress with his optimistic view that was reflected in the TV series. Produced by New Diorama Theatre, in co-production with Greenwich Theatre, playwright/director Byrne with Kate Stanley, on an imaginative set and screen projections, guide the cast through a study of human life. How well can humanity succeed in understanding the past to create a better future? Three non-linear time frames, ancient past, recent past and the present, intermingle in this search for the story of humanity. In the present, when Ava (Stella Blue Taylor), goes on a tinder (think "match.com" or "eharmony") and meets Jamie (Andrew Strafford-Baker) in a bar. He is the grandson of the late Jacob Bronowski. A little wine and one thing or another lead Jamie to bring Ava home for the night, his home is where Jamie moved after his grandmother, Rita Bronowski's death. It is a fascinating house, made famous in 2014 in an international non-fiction bestseller by Yuval Harari, Sapiens: A Brief History of Humankind. According to Harari, the house contains a locked, alarmed room wherein 1949, Bronowski put his philosophical and scientific secrets of human interconnection, communications and shared imaginations that have led to myths and, believes Bronowski, a utopia. Ava, who is intrigued by Bronowski's theory of humanity and has started poking around the house, sinking into the papers and ideas. The secrets in the locked room are revealed in a second part of the play that takes part after Michael Parkinson's BBC interview with Jacob Bronowski (Richard Delaney). Bronowski (called "Bruno") confidently predicted at the interview that he after would live longer than his grandfather. Unfortunately, soon after the talk, he dropped dead. 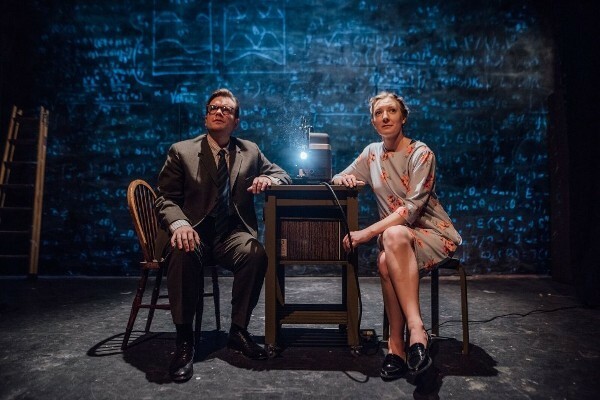 His academic secrets remained in the locked room of his home, protected by his wife, devoted Rita (Olivia Hirst), for a half century, until delved into by Jamie and Ava leading to the second part of the play. This includes Bronowski's stories of World War II when he was a Polish émigré living in London. During the German blitz, he volunteered to give the RAF Bomber Command top secret aid, which led to the devastating bombing of Dresden. A vital question arises about how useful is human knowledge since it just leads to our own destruction. Bronowski is struck by this when he witnesses the horrors of Hiroshima and Nagasaki. Intermingled with the wartime stories are lecture segments, delineated by sliding bookshelves. Taylor plays a persistent Ava, delivering narrations to the audience as smoothly as she interacts with Jamie and as astoundingly as she communicates with the articulate Delaney as Bruno. The third part of the play goes back 60 million years, tracing humankind. Projections portray Borowski's belief that early ancestors began taking the steps of civilization and passing on the vestigial traits, good and bad, that make us human. These two-time frames co-exist each vastly different and in dimensions that are vastly different, thanks to projections by Zakk Hein and aerial designs by John Maddox that is intriguing, creative and ambitious. When characters walk across the walls, we see them from a unique perspective. The set design by Jen McGinley is space, dark with suggestive lighting by Geoff Hense. "Human is not something we are. But something we are all learning to become. A journey we are all a part of. We become human across the entirety of our winding evolution," Bronowski stated. Visually the theories reveal themselves although the plot contains millennia of time and humanity into 90 minutes, directed with brisk theatricality by Byrne and Stanley. Are we all doomed toward our destruction, leaving only footprints in the sand? You won't find answers here but the complex questions continue in this challenging production.